Home care involves professional health care and supportive services given at home. A person may need home care during specific times to recover from surgery or a long hospital stay. Other people may need more long-term home care. A person with cancer, so they can spend less time in the hospital. 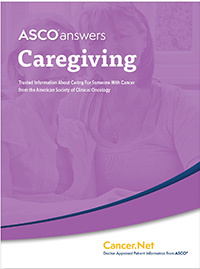 People with advanced cancer can even receive hospice care in the home. May also be trained to provide more complex services along with a nurse. These services may include wound or ostomy care. An ostomy is a surgically created opening for getting rid of body waste. Talk with the patient's health care team to find out what home care services are needed. Develop a plan for home care and ask for recommendations. Types of agencies are listed below. These agencies assign and supervise various types of home care personnel depending on the needs of each client. This includes nurses, therapists, social workers, and home care aides. Some agencies can help you develop a care plan. Many agencies are Medicare certified. This means they meet federal patient care standards and provide services that are covered by Medicare and Medicaid. These agencies screen, hire, and supervise the professionals. They also pay the professionals' salaries and take liability for care. These agencies provide home care aides, attendants, and companions. Most agencies hire and supervise their own personnel, making them responsible for the care provided. Some states require a license for such agencies. These organizations act as employment agencies that match clients with nurses, therapists, aides, and other personnel. The services are generally not licensed or regulated, but some agencies do screen their personnel. The client is responsible for selecting, supervising, and paying caregivers. These are home care personnel who are privately employed by the client. The client is responsible for hiring, supervising, and paying these caregivers. The client also checks their credentials and references. A social worker or hospital discharge planner may be able to recommend independent providers. Are you accredited by a recognized agency? Do you specialize in a specific aspect of home care (such as nutrition)? Do you have experience with people with cancer? Do you provide a written treatment plan that states the specific tasks that you will perform? Do you notify the family if the plan changes? How do you oversee the quality of care a person receives? Who is the contact for questions or complaints? Consider your different options for making payments. Medicare and Medicaid. These government-run insurance programs usually cover part-time home care provided by skilled medical professionals, such as nurses, doctors, or therapists. A doctor must approve and review the services provided by these agencies. The Veterans Administration also pays for some home care services for qualified veterans. Private insurance companies and health maintenance organizations (HMOs). Insurance companies often cover some short-term home care services. But coverage varies from plan to plan. Many will pay for skilled medical care, but not for personal care, such as an aide or attendant care. Some companies may require you to use certain home care agencies or personnel. Check with your insurance company before beginning home care services. Private long-term care insurance may also pay for longer-term home care services. Self-pay. This means out-of-pocket payment for services not otherwise covered. Out-of-pocket payment is money paid by you or the person with cancer. Long-term care provided by an aide, attendant, or companion often requires out-of-pocket payment. In some cases, you may be responsible for taxes. Talk with your accountant or tax preparer about the tax laws in your area. Volunteers. Volunteers from local places of worship, home care agencies, or community organizations may also be options. These volunteers can provide companionship, limited personal care, respite care, meals, or transportation services.